“Punch the monster in the mouth.” “Turn off the poop.” “Early is on time.” To most of us, these phrases might be considered colorful or silly or non-sensical. However, aboard the sailing school vessel (SSV) Robert C. Seamans, they take on a whole new level of importance and meaning. To “punch the monster in the mouth” is to use proper technique when coiling and hanging a line. 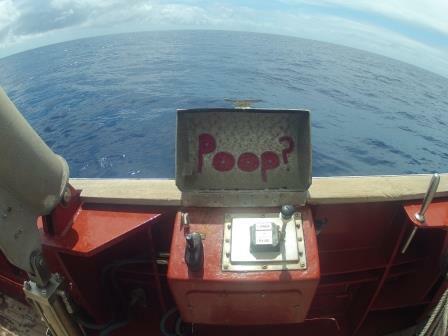 It is necessary to “turn off the poop” to avoid sample contamination because the boat’s grey water tanks are vented upstream of where our scientific equipment is deployed. “Early is on time” refers to showing respect for those standing watch before you by arriving 10 minutes before the end of their 6-hour shift. Treating phrases like these as guiding principles is vital when aboard the 138-ft RCS; being categorized as a SSV means there are no passengers, only working crew members. And with a crew of 40 people – 8 nautical staff, 4 scientific staff, 4 visiting scientists, 1 I-Kiribati observer, and 23 college students – it’s important that we are all speaking the same language and working in sync together. But let’s be honest, it’s also more fun to have someone ask you to “turn off the poop” then instruct you to avoid contaminating the seawater sample. An important reminder before science gear deployment! 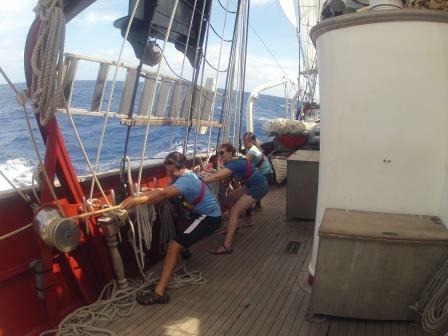 On July 4, Sea Education Association (SEA) Cruise S-268 set sail aboard the Seamans from Honolulu harbor. Over the next six weeks, our journey will include an extended visit to the Phoenix Islands Protected Area (PIPA) of the Republic of Kiribati and will eventually end in Pago Pago, American Samoa. Alex, Jennah, and Haidee work on their “lines”. The goals for each individual during this journey are varied; mine involve playing the role of scientific diver to collect photographic data describing the current health of several of PIPA’s coral reefs (more details in a later blog post). But regardless of one’s individual goals, all of us will be striving to build a working community through clear communication, teamwork, and a positive attitude. This is no easy task in and of itself; try to imagine being trapped in your home with 39 other people that you have just met for six weeks! Thankfully, us pollywogs will be able to rely on the patience and experience of our professional staff as we learn correct ship navigation, sail handling, science gear deployment, and lab work. And while each individual’s experience will vary, I have no doubt that we will all be bonded eternally by the time we reach Pago Pago. That’s all for now – I need to go find that poop on/off switch!